The Government will have a 2 hour late opening this morning. Train schedules can not be adjusted and more cars cannot be added to our service during these late start events. Consist swaps, however, can be performed and the longer train sets will be moved to the later departure times. Earlier forecasts called for a mix of rain, freezing rain, sleet and snow in the VRE service area. Current temperatures are hovering above the freezing mark, but in case temps drop use caution driving and walking to station platforms. Also, use caution on board the train as water can cause aisles and stairs to be slippery. Submit a Form, e-mail gotrains@vre.org, or call 703-684-1001. Follow on Facebook, Twitter, Instagram and YouTube. FAQ: What is being done about crowding on trains? We are working on gaining additional storage space so we can add additional cars to our busiest trains. Also, we encourage riders willing to consider schedule adjustments to visit vre.org/flex to review ridership patterns for each train. your elbow to help prevent the spread of germs. ABOUT VRE: Virginia Railway Express (VRE) began its service in 1992 for commuters in the Northern Virginia and Washington, D.C. area. VRE’s routes include the Fredericksburg and Manassas lines serving nearly 20,000 passengers daily during days of operation. VRE’s two system lines run parallel to the I-66 and I-95 corridors. VRE focuses on providing safe, cost-effective, accessible, reliable, convenient, and customer responsive services to its riders. 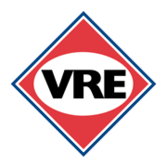 VRE is a joint project of its two parent transportation commissions, the Northern Virginia Transportation Commission (NVTC) and the Potomac and Rappahannock Transportation Commission (PRTC).